Another early morning, up at 6.30am. Had to pick my way through the wreckage of my dorm mates luggage and went to have the free pancake breakfast at the hostel. The weather had taken a definate turn for the worse and it was miserably rainy and cold. A bunch of folks at the hostel were not impressed as they were leaving that morning for a 3 day camping trip on Fraser. Note to self: What not to say to these guys “the weather was fabulous yesterday!” I just couldn’t resist. Then met “Sparrow” our driver for the return bus to the Gold Coast. Due to a damaged tire we had to make a side trip and got to spend a glorious morning in the town of Gympie! 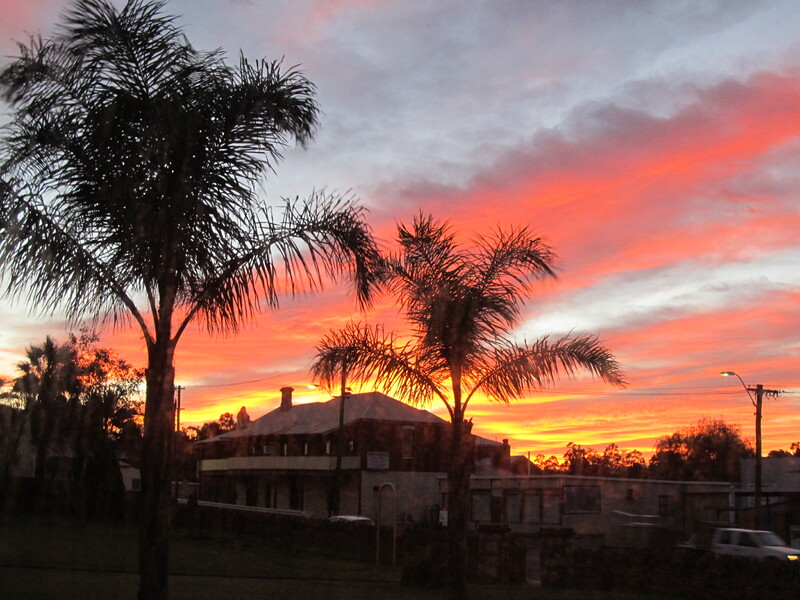 Gympie used to be the murder capital of Australia… just the place you want to go. But, considering we were at least an hour behind schedule Sparrow managed to make up time and we arrived spot on in Surfer’s Paradise. Chris came to pick me up and we went to fetch SJ on the way home. Back at home, I made lunch and later dinner. 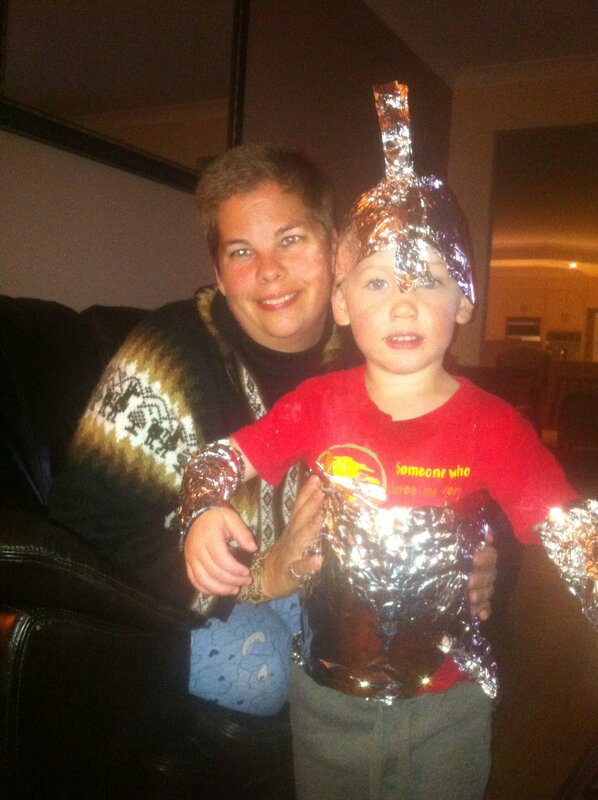 SJ was running around pretending to be a spaceman so I grabbed the aluminum foil and turned him into one. We had thought of going to the movies, the Klopper’s taking SJ to watch Cars2 and me to Harry Potter. I decided to rather save the money and hang out at home and get some stuff done. This was such a good idea that everyone decided to just chill out at home and Coral went with SJ to get a few videos. I had been requested to make my lemon stuffed chicken again, apparently it was quite a hit. As my flight left quite early and I wanted to try and finish the “Power of One” so I could leave it for Chris, I called it a night. Finished the book around 11.30pm!! My flight was leaving at 8.55am, so we were out the door by 7.30am. Would have preferred to go earlier but it all worked out ok. I walked upto the checkin counter and was amazed that there were only 3 people waiting. Then I realised that was the international flights. My flight had a line almost out the door and me only 30min till flight boarding. I asked someone and was directed towards an empty counter, apparently they expect some of us to come right on time. I was offered an aisle seat with more legroom. After a general giggle from both the guy checking me in and myself, as I am the last person needing extra legroom, he clarified that I looked fit enough to help out. I mentioned I was a vet nurse and he asked if I could help fix the Hendra Virus then (the virus spread by bats, infecting horses and then humans). I asked if we expected any horses on board? 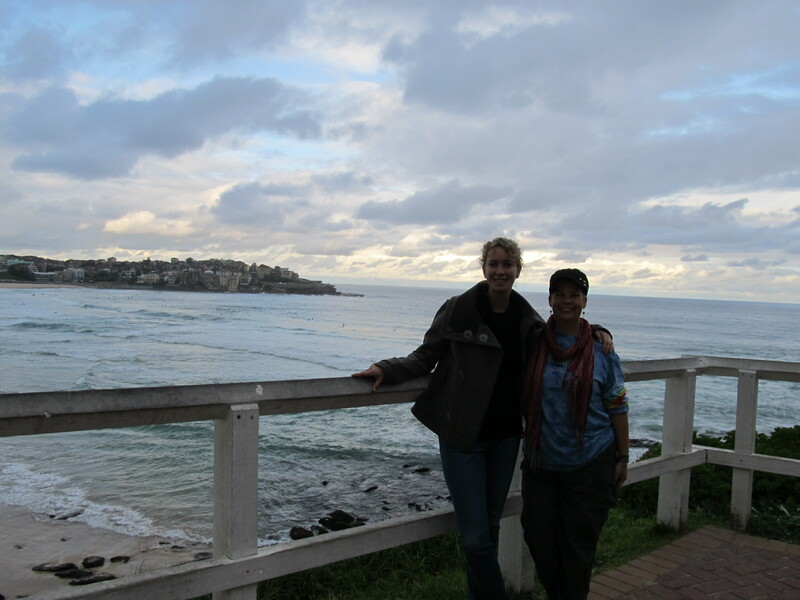 The flight went smoothly and I managed to find my way to Bondi Junction where I met Maz. Maz had been a surfer with me back in 2008 and this was the first time we had met up since. Catching the bus to her house we caught up on each others news. Then we went out for brunch and Maz bought me the best breakfast ever. A bacon, chive, potato, cheese omelette with turkish bread and an extra side of bacon. UN BE LIEVE A BLE!!!!!! The coffee was great too. Then we went with her friends to the little sunday market and I managed to pick up a new hat. I tried to bargain with the guy, who wanted $25. He was definately NOT the bargaining type and seemed almost insulted. Oh well, can’t blame me for trying. Saying cheers to her friends we went for a walk down to Bondi Beach. I must admit it is a lot smaller than I expected but still not bad for being in the middle of the city. 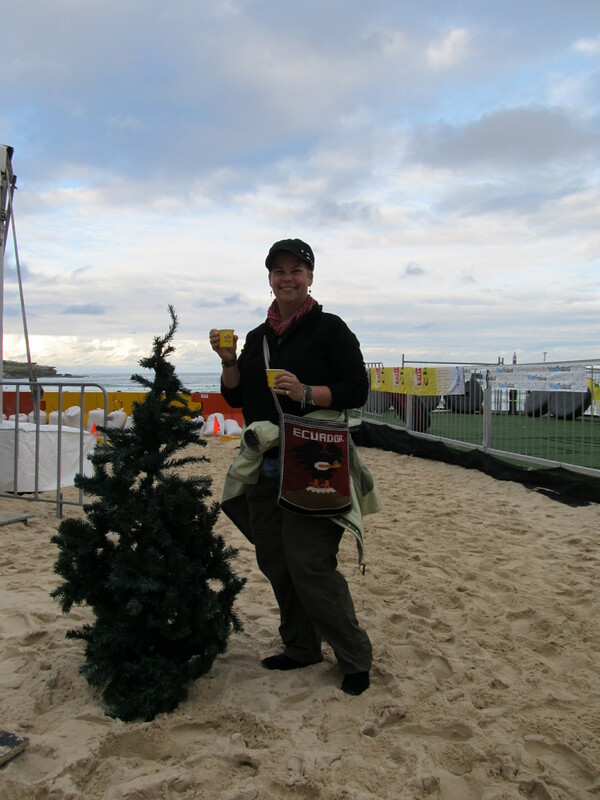 There was a Christmas in July fest going on with an iceskating ring, free chai, Oktoberfest food and fake christmas trees. The chai was delicious and the atmosphere fantastic. We planned to walk up along the headland and over to the next beach, but a huge cloud had other ideas and the heavens opened as we were running back to the chai tent. We then decided to head home and Maz made us pizza for dinner. Tomorrow its all about exploring the Sydney Harbour. As it was Saturday it was also chore day and I soon had the duster and polish thrust in my hand for morning duties. After that we had planned to go to the markets and then the beach, but stopped off at the Harbour Town outlet malls to pick up Chris’s new glasses. We never left! We decided to just stay and look for a few things while we were there. After the horrors of the previous week in searching for a bikini, I was a little apprehensive, but dove in regardless. I headed to the speedo store and this time let the attendant help me out. She suggested about 5 different styles and if you would believe it, the very first one worked and, if I must say, looked rather nice (as long as I didn’t stand sideways and kept my posture that is). I couldn’t believe that, compared to how mentally stressful the search had been the week before this week had been a breeze and almost ego boosting…almost. Plus for a speedo it only cost $40, so I think I did pretty well all around. We stopped into a few more stores and picked up a couple of things then went back to the shoe store to see if the boots were still there. They were and they looked great, so I decided to splurge a bit and spent $45 on knee high lace up boots (well it is cold in NZ and I need some closed shoes, right?). Heading out we went to the promised “surprise” for Stefan John, McDonald’s. Mainly because they have a great playground. They also have rather half decent coffee these days with an actual coffee bar. Not sure if they have that in the States as I hadn’t stepped into a McD’s for years until arriving here. McD’s also has free wifi, so have had a number of coffees (which are the same price as an actual coffee shop), in the past few months of travel. Back home I made cookies with Stefan John, or rather he was chief cookie dough taster and continually “encouraged” me to finish up. A pretty good day in the end and except for the fact that the shoe shop only gave me one lace, I am thrilled with my purchases. Sunday morning we missed chores and headed out early to the Carara Markets, a fantastic weekend market with lots to see and do. 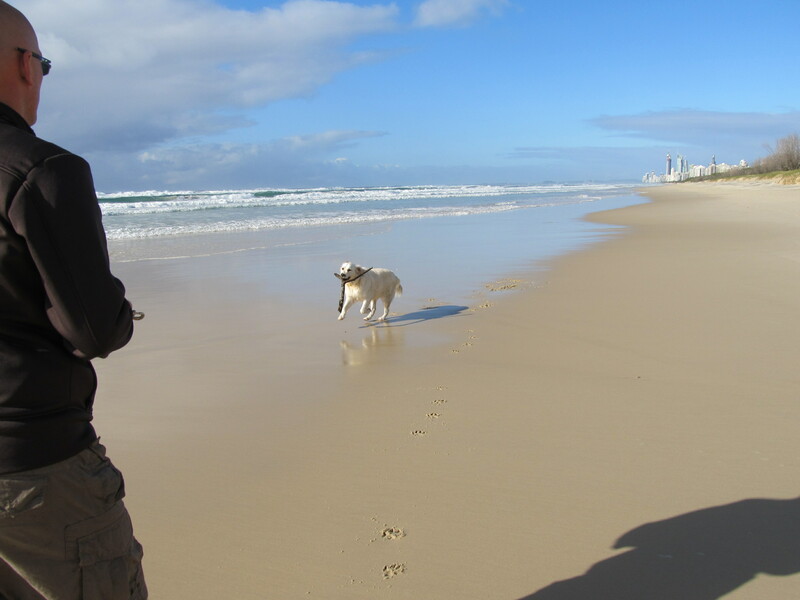 Then we headed towards Currumbin for a family day at the sanctuary. I was a little nervous as due to certain unexpected happenings I would be unable to complete the 2nd week of volunteering. My fabulous friend Joel, who I had met in Hawaii 4 yrs ago and not seen since, had called to say that, as a driver for OZ Experience, he could get me a free ride to Rainbow Bay when he passed the Gold Coast on Wednesday and a free ride back down on Friday with another driver. That way I could get a tour to Fraser Island, apparently one of the MUST SEE’s in Australia. This meant that my 2nd week at Currumbin was essentially null and void. I felt really bad and brought cookies with me as an apology. We rode the little train from the entrance of the park to the hospital section and while the family watched a turtle surgery, I popped in to make my apologies. My first head nurse, Tash, was there and when I explained the situation she was all for me taking the trip to Fraser and completely understood, I dare say she was almost excited as it meant I had brought cookies. I said my farewells to the nurses I knew and headed out. I must say I learnt so much in the that week, and while I had been nervous at the fact that I had not nursed in over 6mths, surprised and happy at how naturally it all came back to me. Maybe I do I have a calling after all. A special thanks to Deb for accepting me, to Tash, Shelly, Pat and Jess for showing me the ropes. To Erina, vet, for being patient with my questions. And to all the volunteers for doing such a great job, especially Colette and Hamish (my co-volunteers), it was great working with all of you. Holey! This does not do him justice! 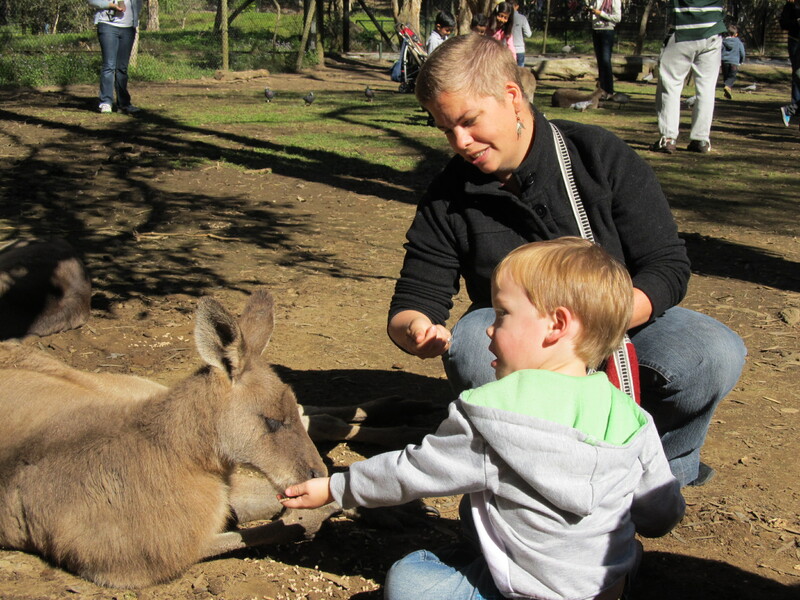 After Holey, we walked through the free range kangaroo exhibit. SJ and I even got to feed them. Too cool for words! Unfortunately they were so over fed, they pretty much seemed bored. After some play time at the playground for SJ to work off some steam, and a couple of photos on the fake giant crocodile, we headed home to have lunch and nap time. That evening I made pasta for dinner. Nothing much happened on Monday, Coral was working from home so I sat and caught up on some blog entries, photo and video uploads and made the tea for us sporadically. Am drinking so much tea staying here that I am peeing like a racehorse… That night I made a dinner of lemon stuffed roast chicken, roast pumpkin and potatoes and baked zucchini. It was very well received and I have a feeling I will be cooking that sometime in the next week again. 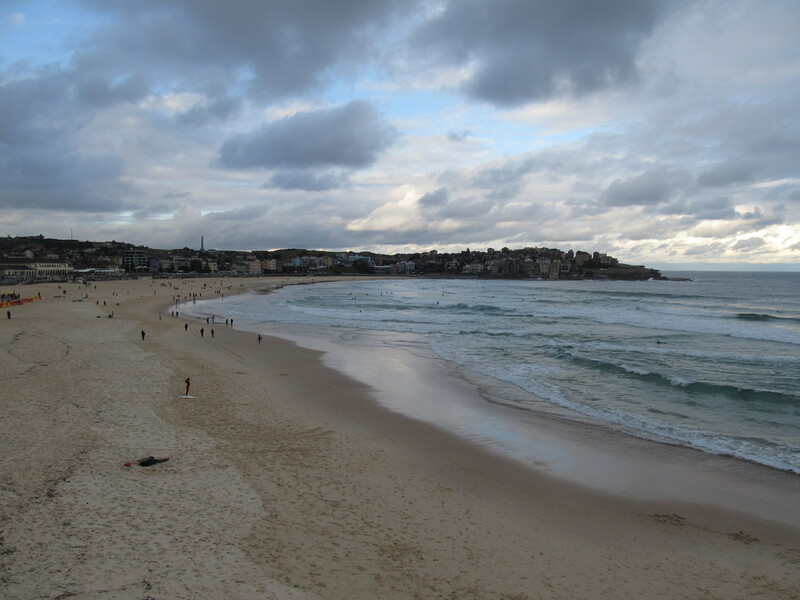 Tuesday I had the day to myself in the house, and just worked on reading, packing for Rainbow Bay and blogs. It was fantastic. For dinner I made fish and chips. Altogether a great few days, but tomorrow its time for a short trip on the road again!!! WOOHOO!!! 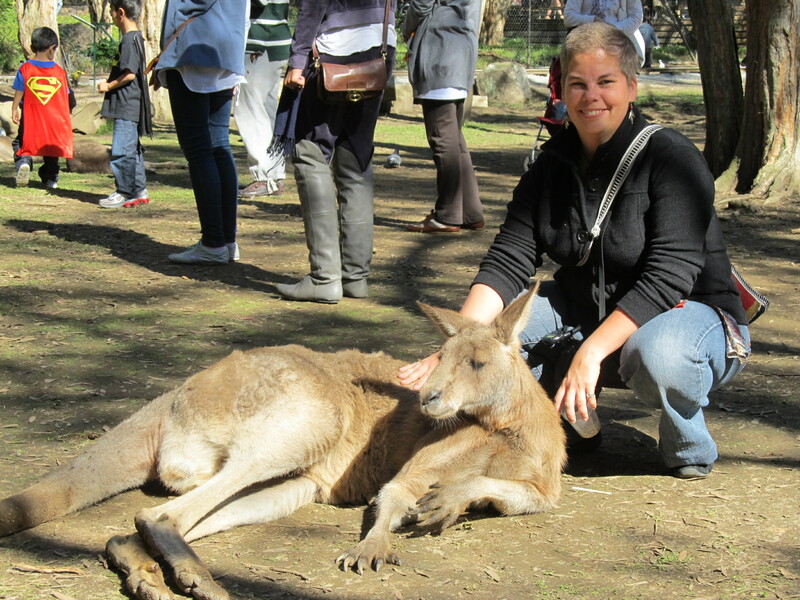 On the suggestion of Chris, I contacted the Currumbin Wildlife Sanctuary concerning volunteer opportunities. I was almost immediately offered a position at the wildlife hospital if I could commit to the 2 week minimum. Checking my calender I worked out that the two weeks would just barely fit into my schedule and promptly agreed. Monday was to be my first day and I was thrown in shortly after arriving, they almost forgot to give us a tour of the facility. Along with me were two new volunteers, Hamish and Collette were doing a two week practicum for vet school. Some of my first duties were to follow Jess in the cleaning of cages and preparation of medication. 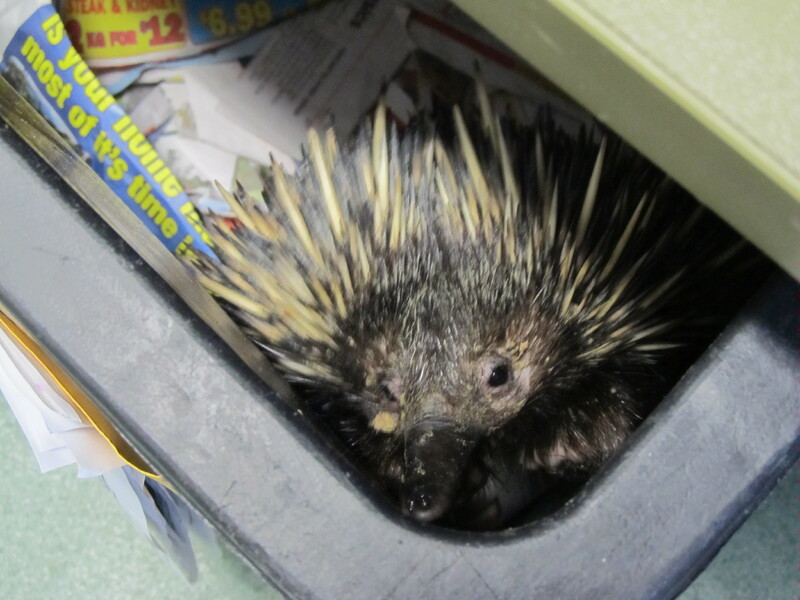 At first glance there were mostly birds, but with some scuffling of papers under the bird cages I discovered my first echidna, Snorky. So named because one of his nostrils had grown over and he constantly made a snorky sound. Other than cleaning cages, I was taught how to medicate birds, how to handle the echidnas and medicate them and was also monitoring animals during surgery and examinations. At the end of day one I headed to meet with my host for the week, a very cool journalist by the name of Kate. I was so exhausted that I could barely move, but after a hot bath the feeling returned to my legs… standing all day in the work force was never my cup of tea. Kate turned out to be a fantastic host and also about to leave on a monumental year long trip, to Europe. It was great talking to her about travel and writing and getting ideas and advice. Day two started much the same with lots of cleaning and monitoring and standing. 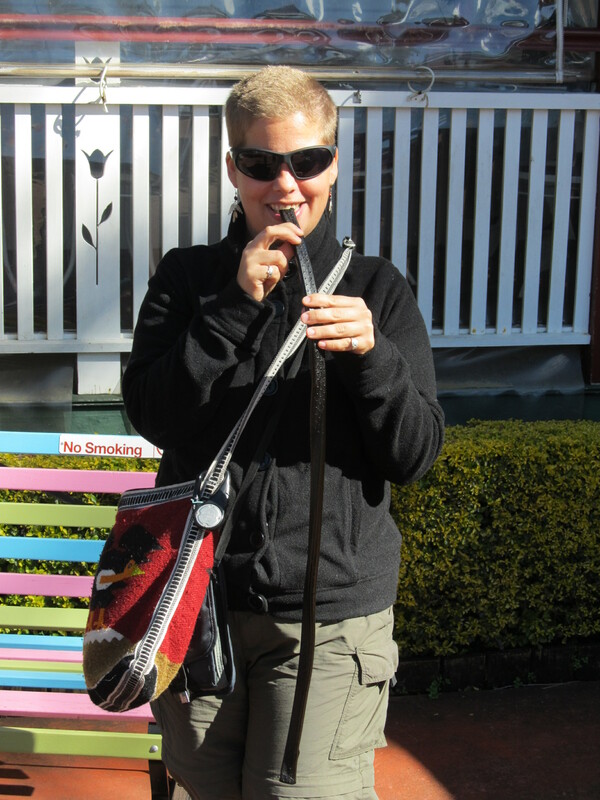 Only this time I had been put in charge of force feeding the Kookaburrahs. Tash, our head nurse, had showed me how to do it the day before and had then passed the responsibility to me. With 4 birds in the hospital this could take a while. 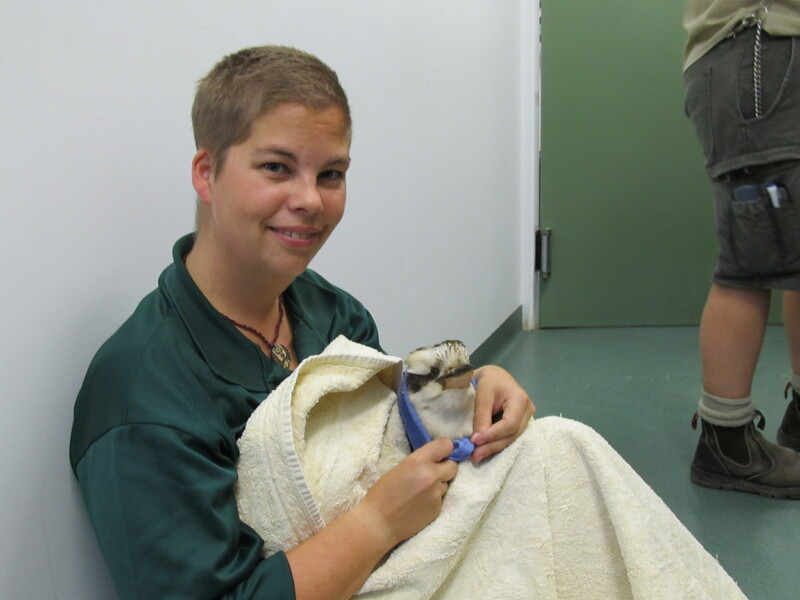 Kookaburrahs are renowned for not eating by themselves while in hospital and so force feeding was required. This meant shaping balls of meat into worm like shapes and then shoving it as far down the birds throat as you could. I ended up being quite good at it. 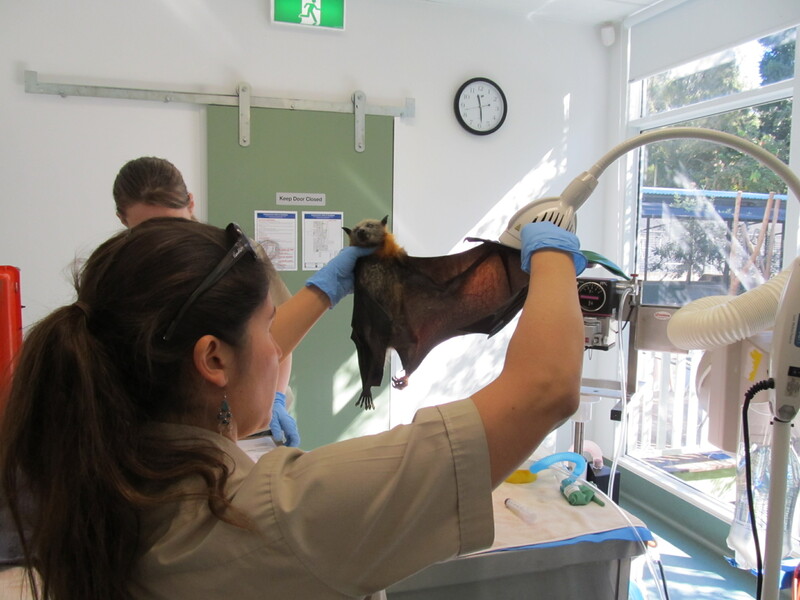 We also had a flying fox come in. 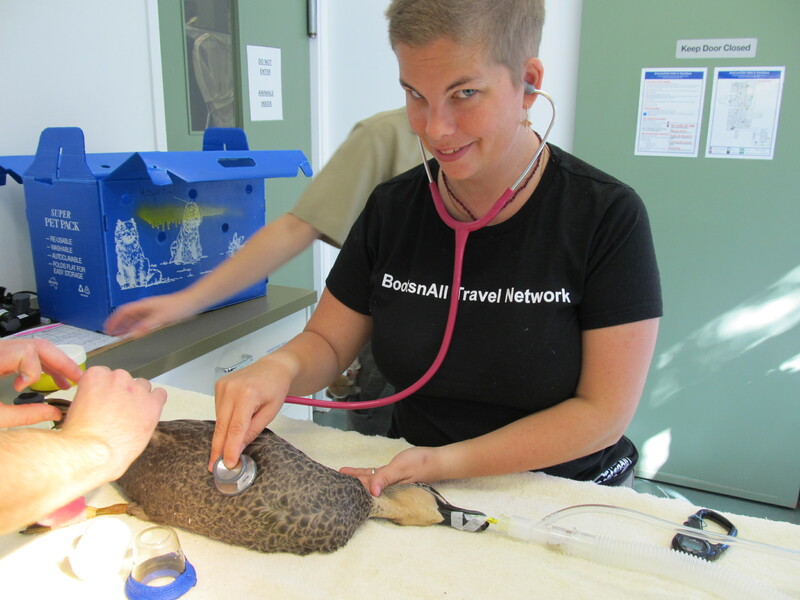 Due to diseases including rabies, it was only handled by the vet and experienced staff. We were also concerned about a recent breakout of Hendra Virus in the area. Spread by bats droppings in water sources for horses and then to humans the disease manifests very quickly and is often deadly. Luckily we had no horses in the clinic so were not concerned about catching it, still made us nervous and we needed to test the bat for the disease. Due to monitoring a bandicoot (similar to large shrew) surgery I only got to force feeding the kookaburrahs at 4.30pm, we finish at 5pm. Luckily I was down to 3 as one had been released. But it still took me a lot longer and with cleaning we only got out after 5.30pm. Day three saw a new head nurse, Shelley, who was fantastic and let me medicate the birds without checking on me. Tash had done a great job teaching me, and so had no problem drawing up correct meds and squirting them down the throats of birds such as Cuckoo Shrikes, Fantailed Cuckoos, finches, King Quail and Crested Pigeons. We also had a young wallaby come in and tiny baby possum. 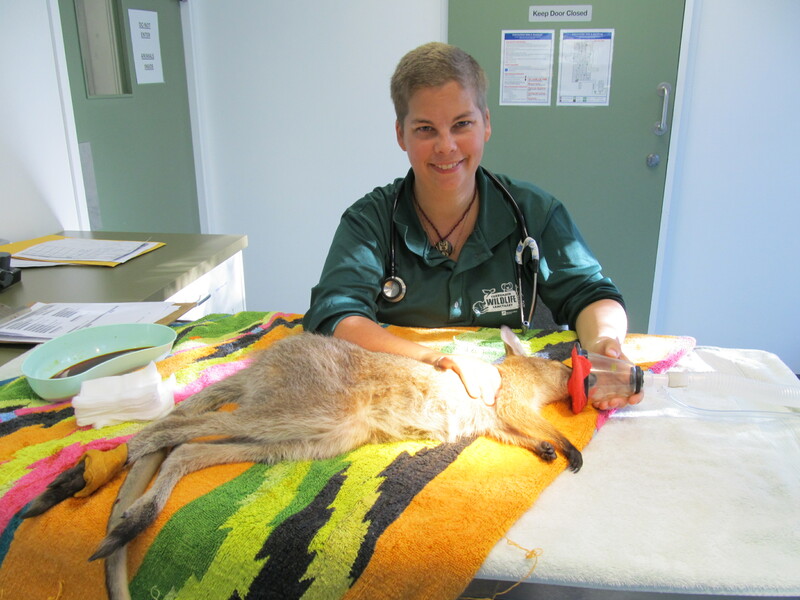 The wallaby had been caught on a fence and had an injury to its foot. The possum baby had possibly been found after its mother was hit by a car. Wednesday continued on the coat tails of Tuesday and had us out late again. During the afternoon while preparing the little bandicoot for surgery to debrade the area around a wound caused by an abscess after a cat attack, we noticed he did appear to be as active as he usually was. We put him on oxygen and I watched his progress. Just as a large group of visitors came to peer through the windows of the hospital (we are on exhibit as well) I realised the bandicoot had stopped breathing. Erina, our vet, gave him a shot of adrenalin and we tubed him in an attempt to save his life. Unfortunately, he had given up the ghost and moved on to happier pastures, most likely without cats. Since the public was watching we had to be very careful how we handled him and had to cradle him as if he were still with us. What a day that was. That night Kate and I went to the local suf pub to watch “State of Origin”, a very big rugby game between New South Wales and Queensland teams. 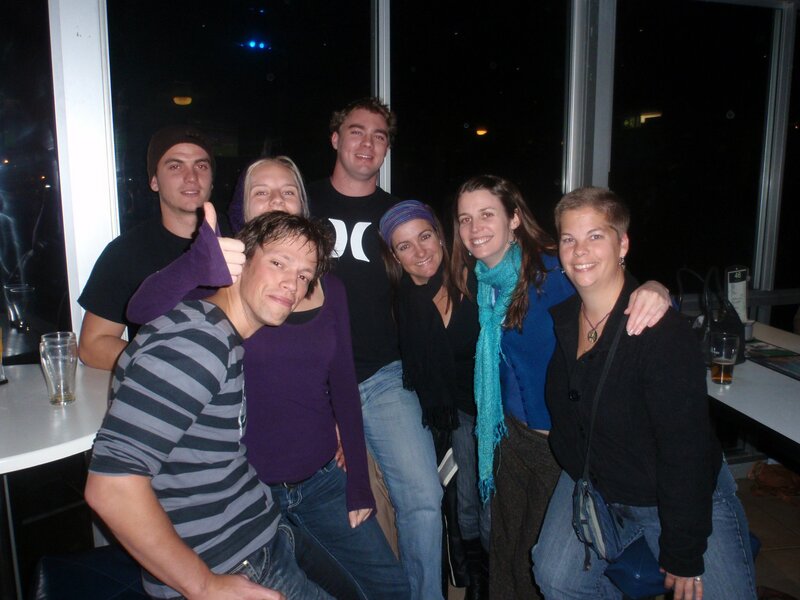 We met up with some of her friends and enjoyed a few drinks. The game started with what appeared to be a walk over by Queensland, but in the second half New South Wales put up a heck of a fight. It was a great night. Thursday saw Shelley and I well on top of everything and without any emergencies we were done by 4.30pm. 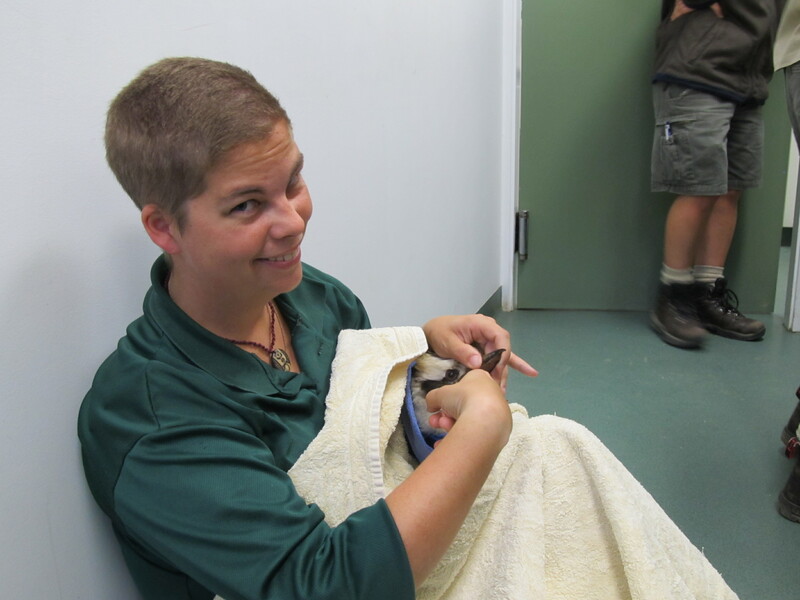 2 More kookaburrahs had also been transferred out to foster care (animals go to foster care for a few days before being released). Leaving me with my favorite, who I had dubbed Hamish after the vet student (they both gave me very sarcastic looks). Kookaburrah Hamish had leg issues and was unable to perch. In fact he seemed to have no strength in his legs whatsoever, which was very concerning. Friday turned out to be a really really slow day. I focused on laundry and didn’t even get round to cleaning a cage let alone medicating an animal. Shelley and I decided to make it a half day for me and I called Chris who said he would pick me up at 1pm. Of course, as Murphy’s Law would dictate, just before 1pm we had a koala come in. 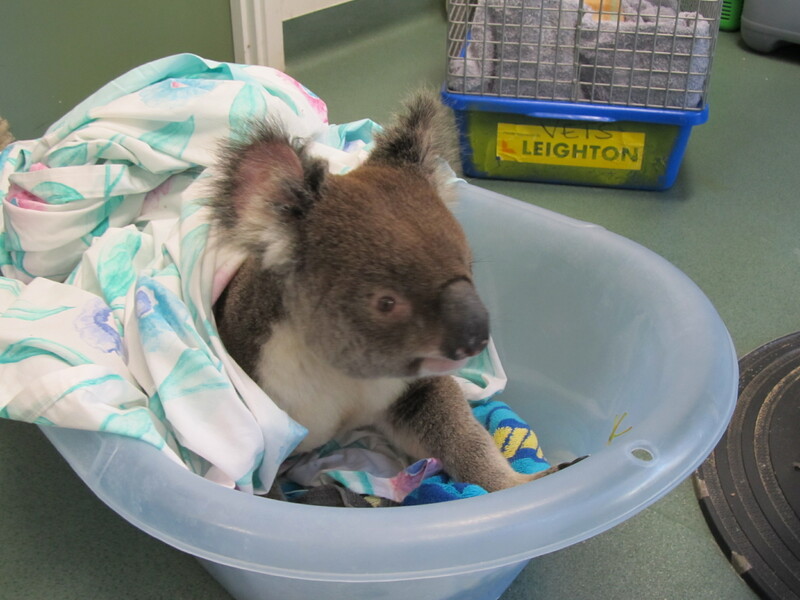 After x-rays we discovered he had broken his pelvis, the person who brought it in thought he may have fallen from the tree, the local term for that is a “Drop Bear”. As I was walking through the door we had a possum come in as well. Oh well, thats how it goes and there were so many vet students and nurses on duty I would most likely have been in the way. It was a fantastic experience and would do it again in a heart beat. 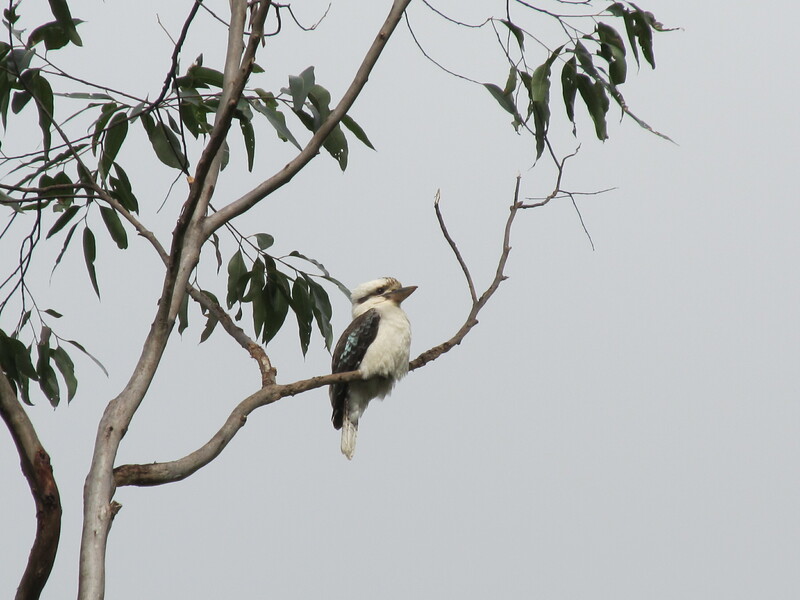 I now also have a special place in my heart for Kookaburrahs. We had a duck come in with severe motor and neurological issues. He was unable to stand or balance and was constantly throwing his head around in spastic movements. We x-rayed him to find no visible fractures or injuries. We gave him charcoal in case he had ingested something with no apparent improvement. We gave him anti-seizure medication, again with no improvement. After a full week of monitoring him and unable to think of anything else we were forced to euthanise. After a necropsy, we discovered his right ear had been full of a waxy buildup, but we are unsure if the 2 issues were related. The bandicoot had been in the hospital for almost 2 weeks before he past away. He had been attacked by a cat and was bordering on frankenstein with all the stitches. Our biggest concern was the large wound on his right hip, after the initial attack this area had abscessed and we were continually forced to debrade and cut out dead tissue. Apparently this species is known to have tissue turn necrotic after a cat bite. Erina would use honey on the wound to help with infection and special algae patches to cover it. We did all we could and we were all sorry when we were unable to save him. 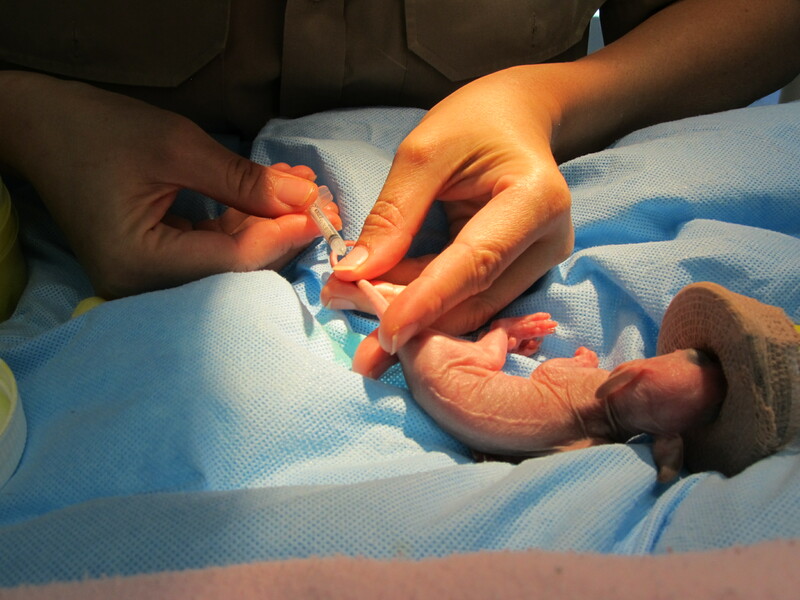 Of the 5 kookaburrahs that came in 3 made it into foster care. 1 died unexpectantly and the 5th was Hamish. He appeared to have spinal injuries as he was unable to perch or use his feet but there were no definate injuries to be seen on x-rays. After 5 days with no improvement and without the hope of him eating on his own and therefore living an ok life in captivity we were forced to euthanise him on my last day. 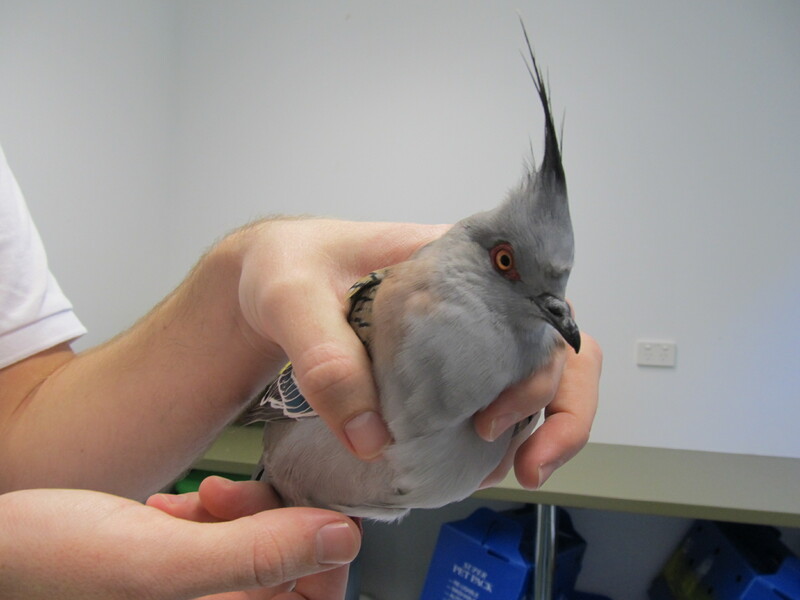 However, due to his spectacular plummage we were able to save his tail and wings to be use for grafting purposes onto kookaburrahs that might need them, so you see even animals are organ donors, or would that be plummage donors. The koala that came in on my last day had severe internal bleeding and a broken pelvis. 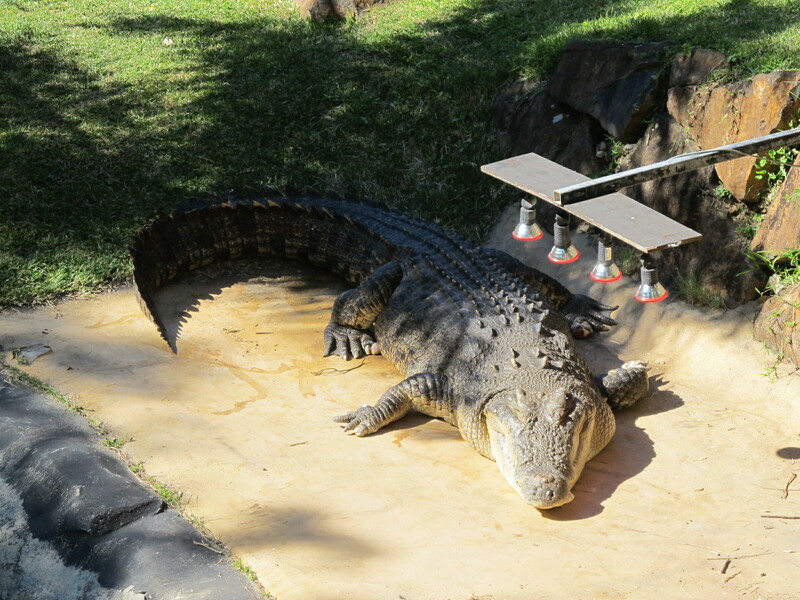 He was transferred to the Australia Zoo (of Steve Erwin fame) where we hoped he might be able to get the care and surgeries he would require. Chris met me at the airport with his 3yr old Stefan John. Chris is a friend from South African days, and it has been over 17yrs since we had last seen each. Chris used to house sit for us and worked in cub scouts with my mom. It was fantastic for him and his family to open their home to me and essentially make me part of the family…chores and all! With not having sleep for over 24hrs I was fairly bushed, but due to prior engagements Chris was unable to drop me at home and so I just followed him around like a zombie. We dropped off Stefan John at kindie and then headed to the university where Chris is a prof. After sleep reading through one of his meetings, skyping the folks to let them know I was there, we finally headed home in time for lunch. I spent the afternoon taking a nap and doing all my laundry, leaving me a pair of leggings, a shirt and a dress to wear until everything was dry. That evening we went to friends, also from South Africa, for pumpkin soup. Then a good nights sleep! Friday we dropped SJ off at kindie and then both spent the day working from home. That night I made dinner and met Coral, Chris’ wife, when she got home from a business trip. In the morning Chris and I took Sadie, the golden retriever, for a run on the beach. After chores, mine was dust and polish, we headed up to Mt. Tambourine for the day. 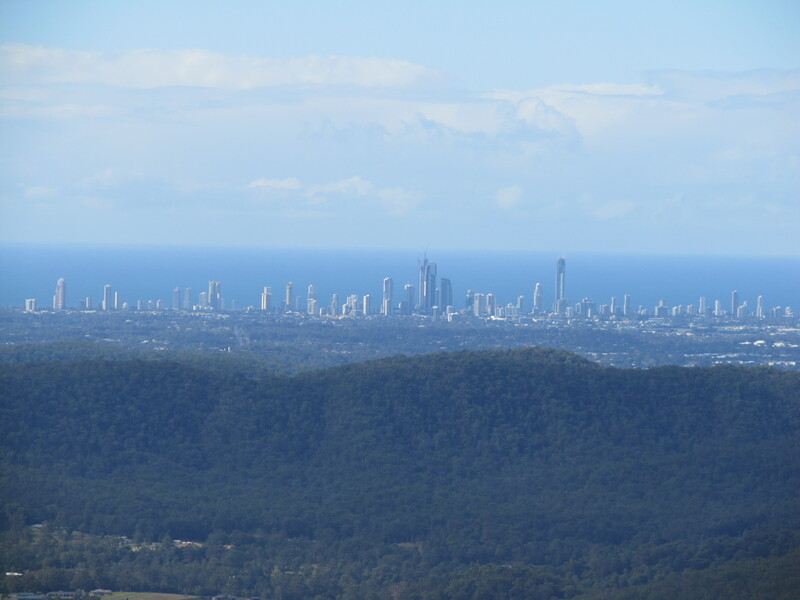 About 40min drive from the Gold Coast, the mountain affords stunning views of the city and a wonderful little town with lots of goodies to eat. After wandering around all the quaint shops we headed to the botanical gardens for a lunch of cheese rolls and chips. 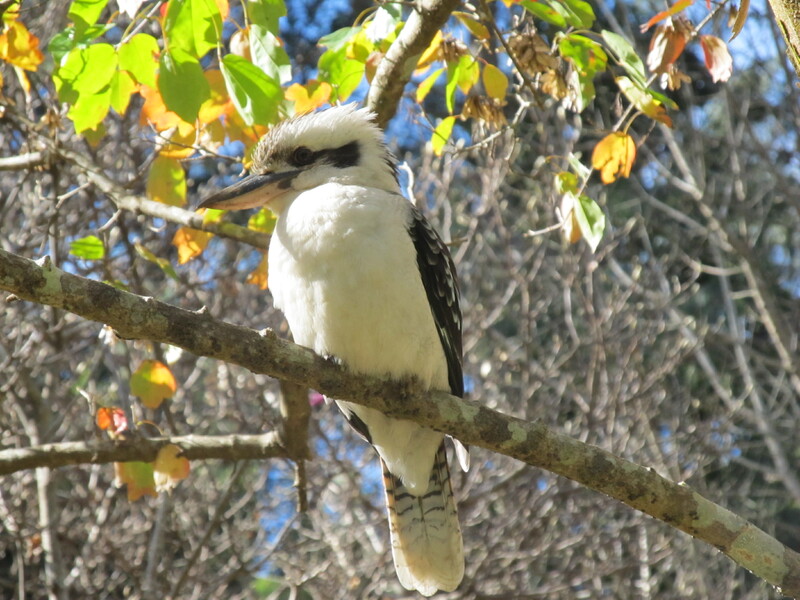 There were tons of birds in the gardens and the most beautiful were the kookaburras. The weather had been stunning all morning, a very unusual thing, and just as we were thinking of packing up the huge grey clouds rolled in, perfect timing. Sunday we went to the Harbour Town outlet stores to hunt me down a new bikini. After about 5 stores I was ready to pull my hair out and when a clerk asked how I was doing I replied “I want to blow my brains out”, she seemed a little startled by that statement and made a hurried exit. Why does shopping for things like swimsuits, and jeans for that matter, have to be so stressful. We decided to return the following week with just Coral and I hunting one down instead of the whole family. Apparently bikini shopping is not a top “to do” item on SJ’s list and he got increasingly frustrated as the morning progressed. That afternoon we completed a few more chores, today I was the window washer. Just like being at home and part of the family. 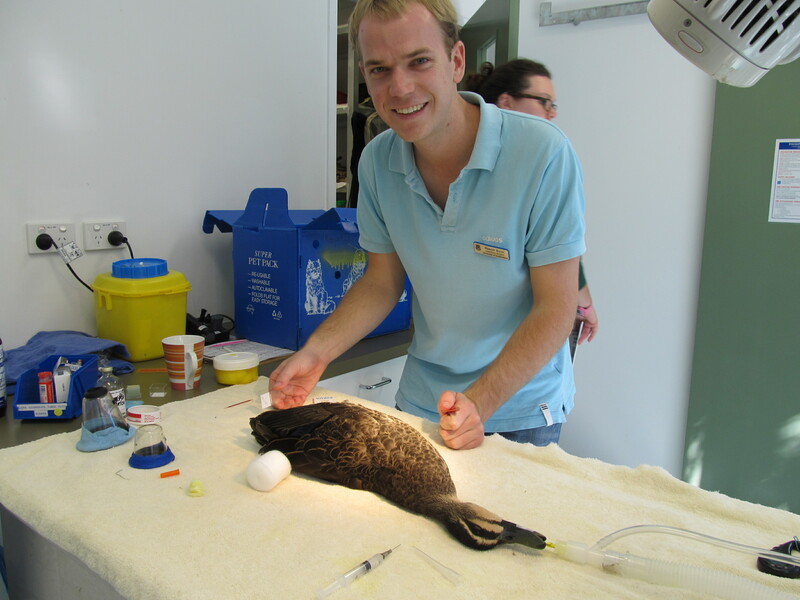 Tomorrow, Monday, I start at Currumbin Wildlife Sanctuary’s Hospital. Am looking forward to it but am a bit nervous at the same time, its been 7mths since I did any vet nursing. Wake up at 6am, breakfast at 6.30am and on the road by 7am with a stunning sunrise to see us on our way. 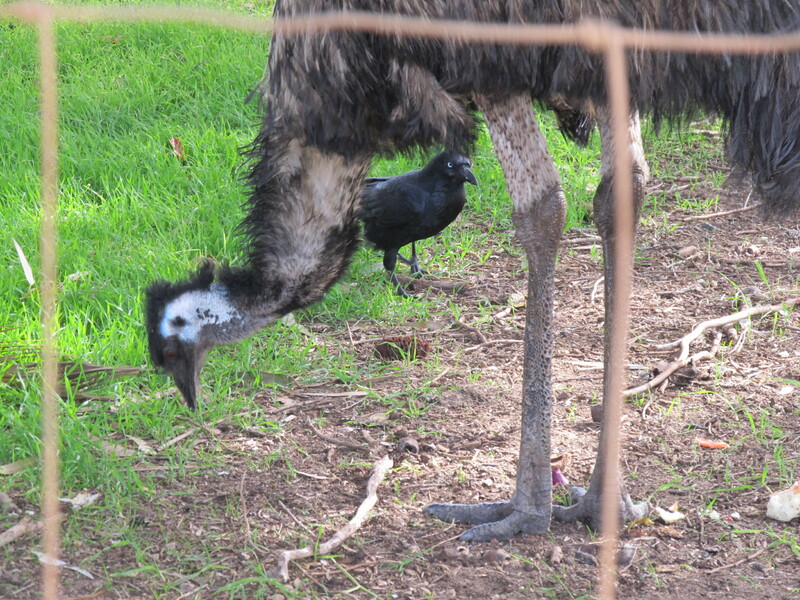 It took another 7hrs to get to Perth with a couple of stops along the way, including a stop at Windmill Cafe where a few Emus are housed. 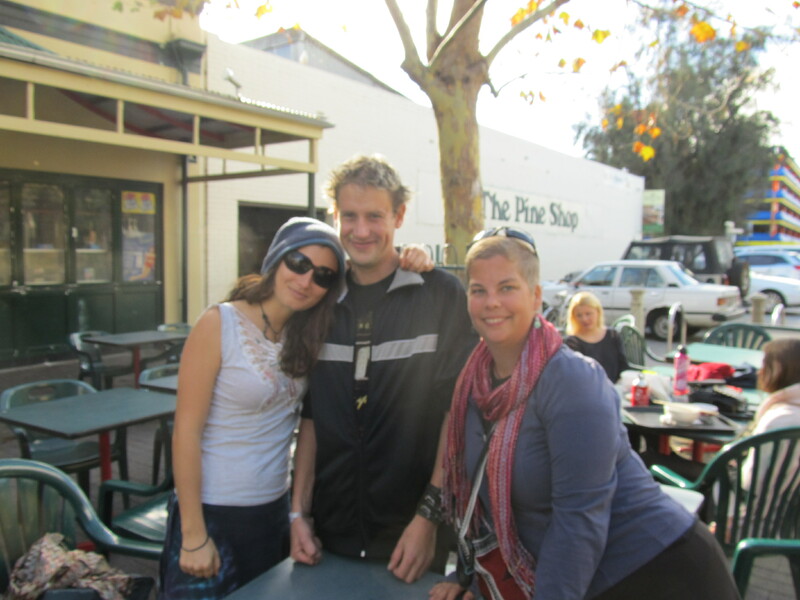 Arriving in downtown Perth I hopped onto the train and headed into Fremantle where I was to meet my friend, Claire. Claire had surfed with me 3yrs ago, along with her friend Scott. We have stayed in touch and it was finally time to call in a favor. It was great to see her and catch up. Her roommates were fantastic and very welcoming. I had planned to do laundry as I was literally down to my last outfit (and had already worn it for 2 days straight), unfortunately the weather was against me and it poured with rain the 2 days I was there. Luckily Deb stopped by with a few things I had left at her place which included a clean shirt and a semi clean pair of jeans. It was a great 3 days and I was able to get quite a bit done as far as blog and sorting stuff also met up with Scott who also surfed my couch in Seattle 3 yrs ago. 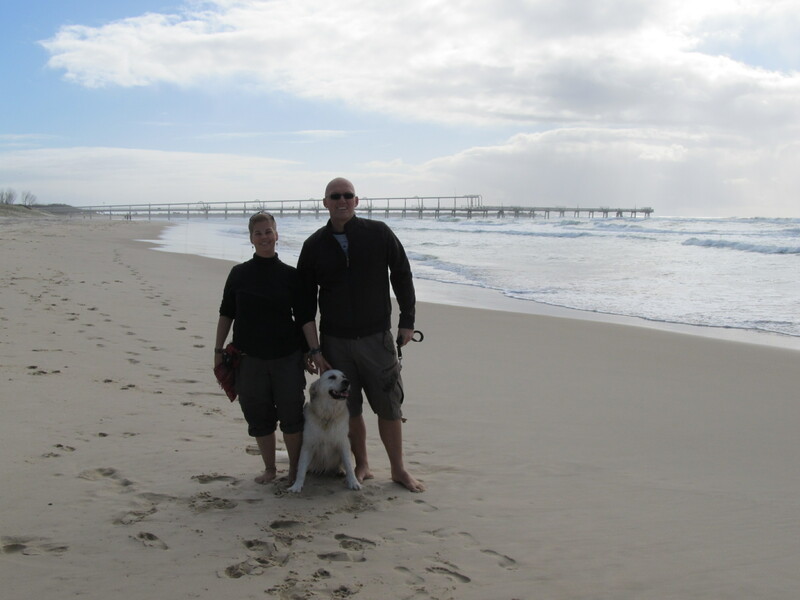 All good things have to come to an end and it was time to leave WA (Western Australia). I was on the red eye to the Gold Coast. Now to most a red eye would be 11.30pm or maybe midnight. For some obscure reason my red eye flight only left Perth at 1.25am. How is this in any way humane to the people flying or the people working. It also means that if friends drop you off its around 9 or 10pm, giving you ample time to do your reading and drink lots of coffee. To make matters worse, even though we only landed at 8.55am the flight was only 4hrs, barely enough time to wiggle into a comfy spot and shut your eyes, let alone get any actual sleep. Claire’s amazing roommate was kind enough to drive me to the airport, saving me the $35 bus ride. Through security by 10.30pm gave me a good 2.5hrs to attempt A) a nap (tried it and managed to find the one spot near a gate which meant a constant draft everytime people boarded or deboarded. B) watch a movie (tried this but battery died). C) read a book or write in my diary (tried this but by midnight my eyes just couldn’t focus anymore. The resulting time was spent wandering in circles around the airport until it was time to go. Luckily karma was on my side for a change and there was a free row, giving me at least 30minutes of REM sleep, when the buckle wasn’t in my back. Thankfully I made it in a somewhat conscious condition…somewhat!